In 2013, the top marketplace of Tupperware was Indonesia, which topped Germany as the second. Indonesia's sales in 2013 were more than $200 million with 250,000 sales persons. Tupperware was developed in 1946 by Earl Silas Tupper (1907–83) in Leominster, Massachusetts. He developed plastic containers used in households to contain food and keep it airtight, which featured a then-patented "burping seal". Tupper had already invented the plastic for Tupperware in 1938, but the product only worked with the emergence of the "sale through presentation" idea, held in a party setting. Tupperware developed a direct marketing strategy the sell products known as the Tupperware party. 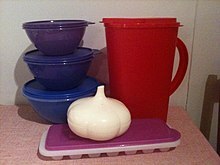 The Tupperware party allowed women of the 1950s to work and enjoy the benefits of earning an income without completely taking away the independence granted to women during the Second World War, when women first began entering the labor market, all the while keeping their focus in the domestic domain. [promotional language] The "party plan" model builds on characteristics generally developed by being a housewife (e.g., party planning, hosting a party, sociable relations with friends and neighbors) and created an alternative choice for women who either needed or wanted to work. Brownie Wise (1913–92) realized Tupperware's potential as a fun commodity. [promotional language] She realized, however, that she had to be creative and therefore started to throw these Tupperware parties. Wise, a former sales representative of Stanley Home Products, developed the strategy. Tupper was so impressed that Brownie Wise was made vice president of marketing in 1951. Wise soon created Tupperware Parties Inc.
During the early 1950s, Tupperware's sales and popularity exploded, thanks in large part to Wise's influence among women who sold Tupperware, and some of the famous "jubilees" celebrating the success of Tupperware ladies at lavish and outlandishly themed parties. Tupperware was known—at a time when women came back from working during World War II only to be told to "go back to the kitchen"—as a method of empowering women, and giving them a toehold in the postwar business world. The tradition of Tupperware's "Jubilee" style events continues to this day, with rallies being held in major cities to recognize and reward top-selling and top-recruiting individuals, teams, and organizations. In 1958, Earl Tupper fired Wise over general differences of opinion in the Tupperware business operation. Officially, Tupper objected to the expenses incurred by the jubilee and other similar celebrations of Tupperware. However, the real reason was that Tupper had been approached by several companies interested in buying him out; he felt that he would not be able to sell with a woman in an executive position. Rexall bought Tupperware in 1958. 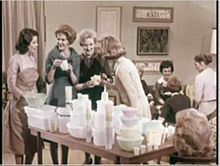 Tupperware spread to Europe in 1960 when Mila Pond hosted a Tupperware party in Weybridge, England and subsequently around the world. At the time, a strict dress code was required for Tupperware ladies, with skirts and stockings (tights) worn at all times, and white gloves often accompanying the outfit. A technique called "carrot calling" helped promote the parties: representatives would travel door to door in a neighborhood and ask housewives to "run an experiment" in which carrots would be placed in a Tupperware container and compared with "anything that you would ordinarily leave them in"; it would often result in the scheduling of a Tupperware party. Rexall sold its namesake drugstores in 1977, and renamed itself Dart Industries. Dart merged with Kraftco to form Dart & Kraft. The company demerged, with the former Dart assets renamed Premark International. Tupperware Brands was spun off from Premark in 1996; Premark was acquired by Illinois Tool Works three years later. In 2003, Tupperware closed down operations in the UK and Ireland, citing customer dissatisfaction with their direct sales model. There has been limited importer-distribution since then. The company announced a formal relaunch in the UK in mid-2011, and recruited UK staff, but in December the relaunch was cancelled. In May 2018, the Israeli daily TheMarker, reported that Tupperware will withdraw from Israel leaving 2,000 agents without a job. The article attributed this decision to the regional headquarters which manage other middle-east countries. Tupperware is now sold in almost 100 countries, after peaking at more than a hundred after 1996. In order for the company to stay in touch with its sales force, early on Tupperware published the monthly magazine Tupperware Sparks. The magazine was full of snapshots of sales women across the country posing with awards and recognitions for high sales. In order to avoid spending money on advertising, Tupperware created events that attracted free publicity. The multi-level marketing strategy adopted by Tupperware has been criticized as manipulative. Statistics released by Tupperware in 2018 showed that 94% of its active distributors remained on the lowest level of the pyramid, with average gross earnings of $653. In recent years, Tupperware in North America has moved to a new business model which includes more emphasis on direct marketing channels and eliminated its dependency on authorized distributorships. This transition included selling through Target stores in the U.S., and Superstores in Canada, with disappointing results. Tupperware states this hurt direct sales. In countries with a strong focus on marketing through parties (such as Germany, Australia, and New Zealand), Tupperware's market share and profitability continue to decline. In many countries, Tupperware products come with a lifetime guarantee. The company is best known for its plastic bowls and storage containers. However, in recent years it has branched out into stainless steel cookware, cutlery, chef's knives, and other kitchen gadgets. After experiencing a slump in sales and public image in the mid-1990s, the company created several new product lines to attract a younger market. In some countries including Belgium, Australia, Ireland and the U.S., Tupperware markets their parties and career opportunities through mall kiosks from time to time. In China, Tupperware products are sold through franchised "entrepreneurial shopfronts", of which there were 1,900 in 2005, due to pyramid selling laws enacted in 1998. The Chinese characters 特百惠 are used as the brand name, and translate as "hundred benefit". The reciprocity that emerges at the “parties,” which are traditionally composed of friends and family members of the hostess, creates a nurturing atmosphere without a direct sales feeling. It was the Larkin Company, however, that were the forerunners of this type of "party", during the 1890s, that were popularized by such organizations as Tupperware. Feminist views vary regarding the Tupperware format of sales through parties, and the social and economic role of women portrayed by the Tupperware model. Opposing views state that the intended gendered product and selling campaign further domesticates women, and keeps their predominant focus on homemaking. The positive feminist views consider that Tupperware provided work for women who were pregnant or otherwise not guaranteed their position at work due to the unequal gender laws in the workplace. The company promoted the betterment of women and the endless opportunities Tupperware offered to women; whereas, the negative view includes the restriction of women to the domestic sphere and limiting the real separation between running the household and a career. The emergence of Tupperware in the American market created a new kind of opportunity to an entirely underrepresented labor demographic; women, and especially suburban housewives. FridgeSmart (US, UK, AU), PrimaKlima (DE), Marine (URU): with air control vents, FridgeSmart containers are modular containers intended for refrigerated fruits and vegetables. FridgeSmarts have air control vents intended to allow different levels of airflow around different types of fruits and vegetables, as well as a corrugated bottom to allow them to store securely on a refrigerator shelf. Stuffables (US, AU), Bungee: refrigerator storage with flexible lids for overfilling. UltraPro (US, DE, AU, UK), UltraPlus : plastic ovenware advertised as being safe when used in a microwave or a conventional oven, with heat-resistant properties. ^ "Form 10-K Annual Report Filed Feb 22, 2011 (FY 2010)". Tupperware Inc./SEC Filing. Archived from the original on 2012-07-27. ^ Cortese, Amy (July 7, 2007). "Tupperware Freshens Up the Party". The New York Times. Retrieved May 19, 2009. ^ Cochrane, Joe. "Tupperware's Sweet Spot Shifts to Indonesia". The New York Times. Retrieved April 7, 2015. ^ "Earl Silas Tupper". Ideafinder.com. Retrieved 2013-02-28. ^ a b Clarke, Allison J. (1999) Tupperware, Washington: Smithsonian Institution Press. pp. 192–193. ISBN 1560989203. ^ Maurer, Elizabeth (2017). "Social Marketing Before the Internet". National Women's History Museum. ^ "Secret History Of: Tupperware". The Independent. 2010-10-08. Retrieved 2017-08-12. ^ Bax C. (2010). "Entrepreneur Brownie Wise: Selling Tupperware to America's Women in the 1950s". Journal of Women's History (free text)|format= requires |url= (help). 22 (2): 171. doi:10.1353/jowh.0.0159. ^ Wortz, Eleanor Thompson. "Fly Gals of World War II". Robertson Publishing. Retrieved September 25, 2011. ^ "Empowering the Community at Risk: The Partnership of PT Tupperware Indonesia and HOPE worldwide" (PDF). Public Health Institute. October 2009. ^ a b "What is today's American Dream?". BBC News. 28 March 2011. Retrieved 2011-03-29. ^ "Party is over for Tupperware UK". BBC News. 23 January 2003. Retrieved 10 May 2011. ^ "Did Tupperware parties change the lives of women?". BBC News. 10 May 2011. Retrieved 10 May 2011. ^ "Mike Roberts". LinkedIn. United Kingdom. Retrieved 2013-02-28. ^ חרותי-סובר, טלי (2018-05-17). "טאפרוור עוזבת את ישראל - ו-2,000 מפיצות ללא עבודה". TheMarker. Retrieved 2018-05-18. ^ Hilsenrath, Jon E. (May 26, 1996). "Is Tupperware Dated? Not in the Global Market". The New York Times. Retrieved May 19, 2009. ^ "Tupperware Home Parties". PBS. Retrieved 29 July 2018. ^ Richards, Laura. "How MLMs — multilevel marketing schemes — are hurting female friendships". Chicago Tribune. Retrieved 30 March 2019. ^ "Tupperware Income Disclosure Summary" (PDF). Tupperware. Retrieved 30 March 2019. ^ "Tupperware to End Partnership with Target Stores". The New York Times. June 19, 2003. Retrieved May 19, 2009. ^ Kilgore, Tomi. "Tupperware matches profit views, sales fall slightly less than expected". MarketWatch. Retrieved 2019-04-01. ^ Tempest, Rone; Farley, Maggie (April 24, 1998). "China Slams Door on Direct-Sales Firms". Los Angeles Times. Retrieved May 19, 2009. ^ "Tupperware adapts to serve diverse markets". Plastics News. November 17, 2005. Retrieved May 19, 2009. ^ Stanger, Howard R. (2000). "From Factory to Family: The Creation of a Corporate Culture in the Larkin Company of Buffalo, New York". The Business History Review. 74 (3): 407–433. doi:10.2307/3116433. JSTOR 3116433. ^ Vincent, S. (2008). "Preserving Domesticity: Reading Tupperware in Women's Changing Domestic, Social and Economic Roles". Canadian Review of Sociology. 40 (2): 171. doi:10.1111/j.1755-618X.2003.tb00242.x. Charles Duhigg, "Why Short Sellers Want to Crash the Tupperware Party," New York Times, Nov. 17, 2006. Elayne Rapping, "Tupperware and Women", Radical America, vol. 14, no. 6 (Nov.–Dec. 1980), pp. 39–49. "Tupperware!" program from PBS' American Experience, 2005. George J. Yarbrough, The Wonderful World of Tupperware. Orlando, FL: United Film Productions, n.d. [c. 1964]. Public Relations film.